This is Alyssa and Karrisha! 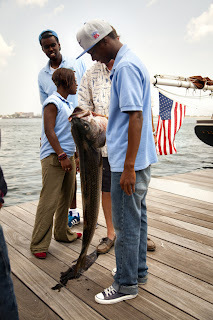 Yesterday, we took part in the second annual Save the Harbor/Save the Bay fishing tournament at Fan Pier Marina. 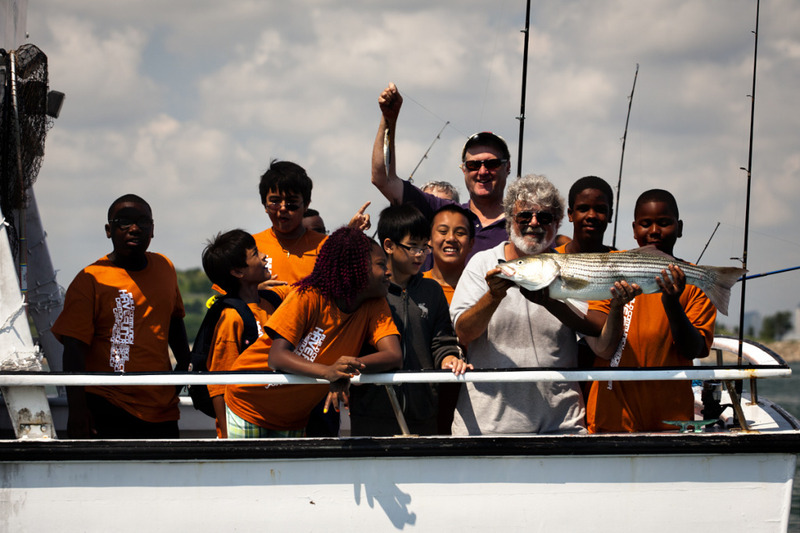 The tournament's competitors consisted of eighteen youth program junior assistants from Save the Harbor, and twenty two members of Camp Harbor View's fishing club. All participants met at 8:00 AM at Boston's Fan Pier Marina. After a quick breakfast on the dock, and a quick pep talk by Joe Fallon who told us to be sure to be sure to "catch and not just fish" everyone was divided up between the five participating boats. The first boat to set off was our boat: the Alban Sport Fishing Boat "Legacy," owned by Captain Rick Mckenna of Wallwork Curry and McKenna. Second off were Captain John Mclaughlin and his mate Cindy from 3A marine service of the boat Miss Blue II. Next was Captain Paul Diggins on his Charter Sport Fishing Boat "Reel Pursuit". He was followed by Captain Mike Fallon on his center console Regulator. 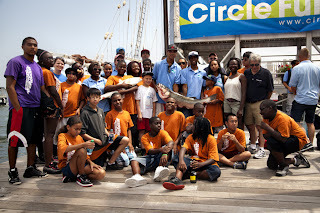 All of the Harbor View campers fished on the boat "Belle" of Boston Fun Cruises with their Captain, Charlie, first mate Darrel,and an experienced crew made up of tournament sponsors Harold and Richard Tubman from Circle furniture and Save the Harbor's own Bruce Berman. The tournament and press boat was Captain Larry Russo's twenty one ft Boston Whaler. Once all of the boats were out on the water, the competition began and each boat started its mission to catch the biggest fish. We went out to the far end of the harbor where, according to our captain, we would surely catch a giant fish. On the boat were Save the Harbor staffers Will Clark, Vinh Tran, and Candido Barros. To start, we used the fishing method "Trolling" with deep diving lures. This is when the boat is in motion with the weighted lures dragging behind, hopefully enticing a catch. Unfortunately, this method did not work wonders and there was no fish to be found. We visited a few of Captain Rick's "top secret" fishing locales around the harbor to track down our winning catch. When trolling did not seem to be working for us, we tried using worms as live bait on an unweighted line. In Captain Rick's words, "a good worm is like a fish's version of a Snickers Bar, and you can never go wrong with a Snickers Bar." While touring on "The Legacy" all of us learned a few tricks of the trade. For starters, a fishermen always wants to have his senses alert for clues that suggest there are fish in the area. Birds tend to know more about fishing than almost anyone else, so seeing a flock of birds gathered in a particular spot, or a bird diving for a catch is always a good sign. Sometimes a fish can be spotted jumping out of the water or lying on the surface to sun bathe. Needless to say, actually seeing these fish is a very good sign. Not only is it important for a fishermen to survey the harbor with his eyes, but his nose is also a helpful guide. Blue fish with their razor sharp teeth are known to eat lots of different types of fish. At one point when we all smelled the "sweet aroma" of dead fish Captain Rick was quick to say that blue fish must have been in the area earlier that day dining. Unfortunately, after three hours out on the water we had to come to terms with the fact that our giant fish was not in any mood to be caught. We returned to the fish pier empty handed to see the results of the tournament. The results were very impressive. 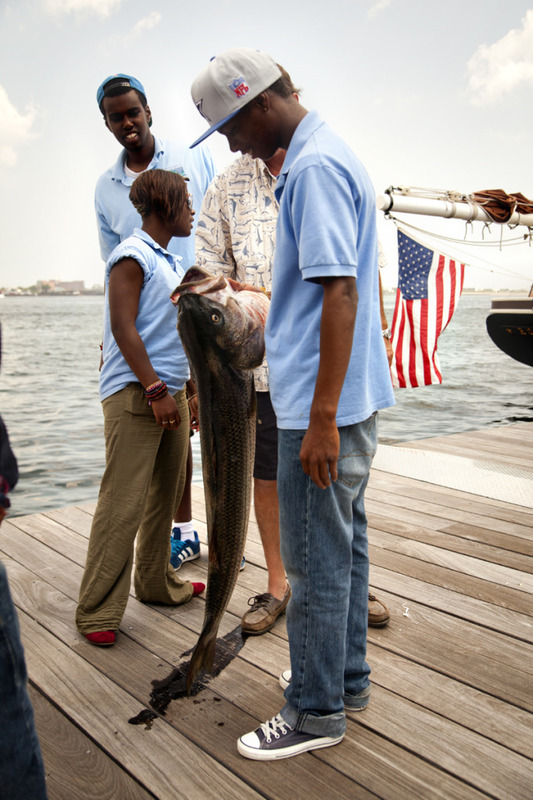 The largest fish was caught by Mike Fallon's team. The fisherman was eight year old Joe Cirame of Saugus who caught the fish while the boat was trolling off of Boston Light. The 46 inch 42 lb striped bass was quite a sight. 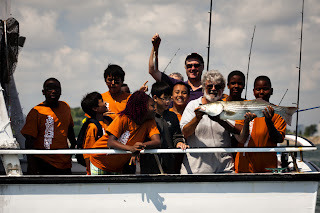 The second largest fish was caught by Harbor View camper 11 year old Brady Marshall of Mattapan, who was on the "Belle" with his fellow campers. The fish was caught between Spectacle Island and Camp Harbor View. All of the campers were very proud of their 36 inch 21 lb striped bass. Camp Harbor View Fishing Club returnbs with their big stripoed bass. Once the groups had enough time to show off their giant fish, they were filleted and divided up between the campers so they could bring a part of their day's adventure home for dinner. "There's no better way to spend the day than on the water showing the kids what makes Boston Harbor great," said Harold Tubman of Circle Furniture who sponsored the event. Certainly the campers and junior program staffers saw this first hand. Although we did not catch a giant fish, we learned that fishing tournaments are nott at all about winning. 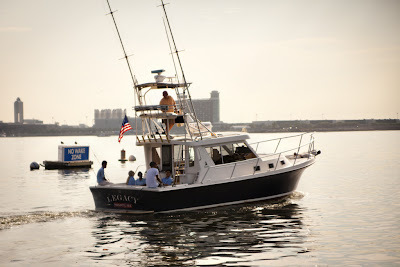 On our one day fishing adventure we witnessed the beauty of the harbor and the one of a kind experience it has to offer.